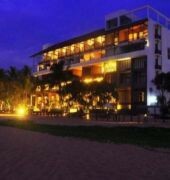 Pandanus Beach Resort and Spa is a beachfront property located in Induruwa, within 5 km/10 minute drive from the centre of Bentota and close proximity to Induruwa railway station. Every room is air conditioned and furnished with IDD telephone, flat-screen TV with satellite channels, in-room safe, work desk, tea and coffee making facilities, wireless internet access and bathroom with walk-in shower. 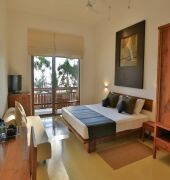 All rooms have a terrace or balcony with view of the Indian Ocean and some have a private Jacuzzi. 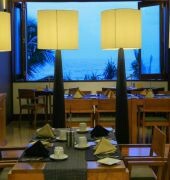 The hotel houses a restaurant that serves Eastern and Western cusines providing buffet meals or al la carte options while the rooftop bar offers a variety of beverages. 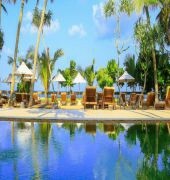 Additionally, theme nights are also arranged on a regular basis by the resort featuring evening entertainment. Recreational facilities include an outdoor swimming pool with sunbeds and umbrellas, kid's pool and state-of-the art gymnasium. 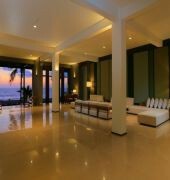 There is also a spa where guests can relax and revitalize with various treatments.